Ok! Welcome to the start of your new life. I have tons of good stuff to share that’ll make 2012 your best year ever. Byfield Dance Experience is still growing and is transitioning into an even better, well ah, experience. THIS IS JUST PART ONE of all the info. Seriously, this place is gonna rock harder than AC/DC. Back in the day, a friend of mine used to call her strict Stepmom her “Step Monster.” True story. So as your old-school, wooden-spoon-yielding strict Nona, I’m telling you now: You can’t leave until you clean your plate. Lick it clean. If you’re anything like me, too much info at once means you start skimming through… then skipping parts entirely. Because it’s info overload. So this is in chunks because I need you to read EVERY word, preferably twice. “…Delete what you think of the studio. Because BDX is now a super-fun FITNESS AND ACTIVE LIFESTYLE STUDIO… People want and remember things, places and services that offer something different. 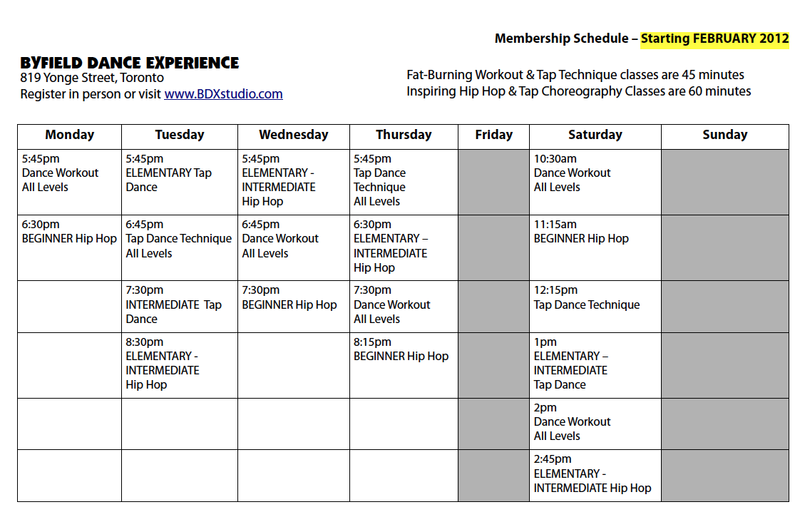 The 60 minute hip hop/ tap CLASSES are for mostly straight choreography. You’ll love and dramatically benefit from this class, because it provides more time to improve your MEMORY, co-ordination and further develop your STYLE. BTW: If you have one, two or even three left feet, the beginner hip hop class is PERFECT for you. So. There’s your schedule. You’ll notice for the most part, it isn’t drastically different from the current times. What days work best for you? Chances are you can fit two classes in one day, if you choose to be super cool. And it looks like our time is up. Thanks for listening to WBDX Radio. Tune in to PART TWO in a few days. You rock for making time to absorb this. …As you continue taking classes at BDX, you’ll feel stronger, sexier & more confident. Not a bad deal, eh? I’ll address other new stuff in the next part, like what happens on Fridays, on Sundays, how your monthly membership investment will change slightly, and Jay-Z’s newborn baby*. Be sure to write or tweet any comments you may have below, so I can get you the answers A to the SAP! *PS: Just kidding. I promise to not talk about Beyonce’s baby. Who cares? Their baby won’t change your future one bit. But classes at BDX can, and will improve your life. Finally some earlier evening classes for Elementary Hip-Hop! And even MORE options! I love it! Who has questions? Share this post and keep the comments flowing! Hello! I am fan of yours from Houston, TX I saw you on you tube a couple of years back and have been hooked your studio ever since! I am a fellow tap teacher. I can’t wait to come to Toronto to visit your studio! I’m making plans for late this year! You are awesome!!!! Thanks for the love Angela, I look forward to meeting you in person! I usually have a challenging 5 day tap dance intensive sometime every August, maybe you can plan for that month? Shawn, I LOVE the idea.. but there are no advanced level classes. Since the intermediate are combined with Elementary, there is no place for those of us beyond the intermediate level and really need a challenge. I’m very sad about this. Will you ever bring back Advanced classes?? Yay to Tap Technique!!!! So glad it’s twice a week (I can’t do Thursdays). Tap technique classes are important – Thanks for adding! Is there any chance you can add advanced tap classes, perhaps on Saturday afternoons? Will there be a set schedule for teachers? Also, could you please advise BDX students in advance if there will be a substitue teacher for classes? Thanks. 1.) Yes, YAY for more tap technique! We can always improve our technique in hip hop and tap. No matter what level you’re at, when we refine the basics of any style, we improve in all aspects of execution and performance. 2.) Sorry Hana. There aren’t enough people (yet) who attend REGULARLY to warrant an advanced class. I DID have that level, but with only 4 of you showing up at a time, that’s not fair for the other levels of dancers who could be dancing in that time. Hi im Ayaka. thanks for ur Massage!! i really like that idea and wanna join again! but.. i have to think.. I love how tap is now offered two weeknights. Also, tech class sounds wicked. I totally want to check it out. Any tap for beginners in the plans ?